SEOUL, South Korea (CNN) -- South Korean commercial airlines have rerouted their planes after North Korea said it could not guarantee the safety of flights near its airspace. 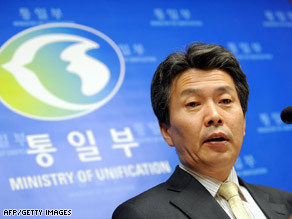 South Korean Unification Ministry spokesman Kim Ho-Nyun speaks at a briefing in Seoul on Friday. Seoul condemned the implied threat on Friday and called on the North to assure the safety of South Korean civilian aircraft. "To threaten military action against a civilian aircraft that is flying under international air regulations is not only against international laws but is an inhumane action," said Kim Ho-Nyun, a Ministry of Unification spokesman. "This cannot be justified for whatever reason." On Thursday, Pyongyang said it was "compelled to declare that security cannot be guaranteed for South Korean civil airplanes" in its airspace, South Korea's Yonhap news agency reported, adding to concerns that Pyongyang may be preparing for a missile launch. With the latest warning, South Korean air carriers Korean Air and Asiana Airlines have added detours to about 14 daily flights. The rerouting will add about 15 to 40 minutes to flights to the United States and to Russia, Kim said. The latest row between the Koreas came a few days after military officials from North Korea and the U.S.-led U.N. Command held their first high-level talks in nearly seven years. U.S. and South Korean officials have said North Korea seems to be preparing to test-fire its long-range missile, the Taepodong-2. Pyongyang tested one of the missiles in 2006, but it failed 40 seconds after launch. The missile is thought to have an intended range of about 4,200 miles (6,700 kilometers), which -- if true -- would make it capable of striking Alaska or Hawaii. Denying recent intelligence suggesting the missile test, North Korea announced in late February that it is preparing to launch a satellite from its northeastern coast. "North Korea requested this meeting to discuss tension reduction on the Korean Peninsula," the U.N. Command said in a statement. "These talks can be useful in building trust and preventing misunderstanding, as well as introducing transparency regarding the intentions of both sides." Rapprochement talks between North and South Korea have hit a wall since conservative South Korea President Lee Myung-bak took office and took a tougher stance toward the North than his liberal predecessor Roh Moo-Hyun. The two countries have technically remained in a state of war since the Korean War ended in 1953, although relations have warmed somewhat in the past few years. The Korean conflict ended in a truce, but no formal peace treaty was signed.